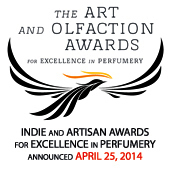 John Oehler is fhe author of Aphrodesia, the perfume thriller. We have three Kindle copies of John’s book to giveaway. To be in the draw, leave a comment below or like Aphrodesia on Facebook. 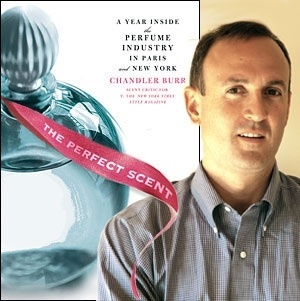 If you do not have a comment about the reading list you could name a character or perfume ingredient in the novel. The winners will be announced here 7 days later after the random draw. B.C.) containing pieces of raw frankincense John bought in Somalia. 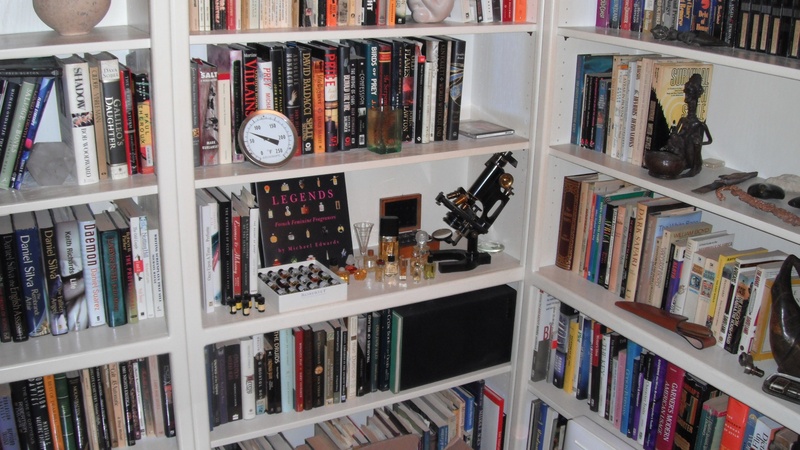 From John: I have a lot of the “standard” books on smell and fragrances and probably a hundred articles on subjects ranging from quirky fragrances to archaeological discoveries, from forensics to smells and flavor, from interviews with perfumers to the smell of death. These are some of my favorite references. The best article I know of on the subject of scent and smell is “The Intimate Sense of Smell,” National Geographic, v. 170, n. 3 (September, 1986). The blog Glass Petal Smoke has this to say about the article. Discovering a great article on olfaction that doesn’t make you feel like a science dweeb is a rarity. 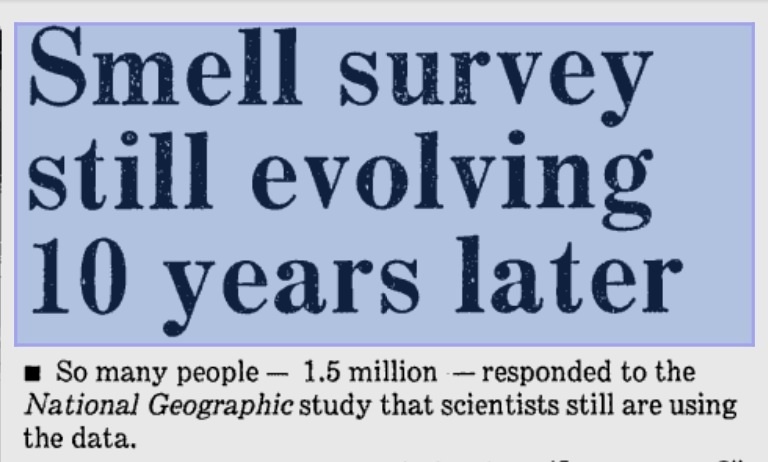 That’s why the September 1986 edition of National Geographic is a must-have for anyone remotely interested in the sense of smell. 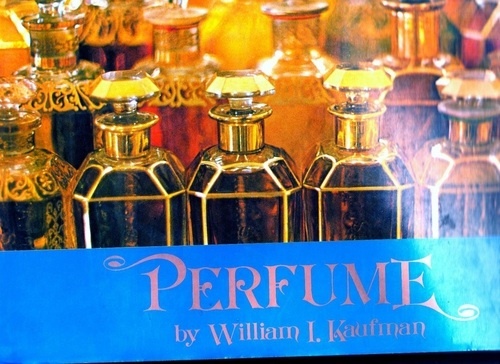 For a fragrance lover, it is the equivalent of finding a hardcover copy of William Kauffman’s Perfume in excellent condition. If I could recommend only one book, it would be this one. I have the hardcover, but it seems no longer to be available. The link above is for the paperback. 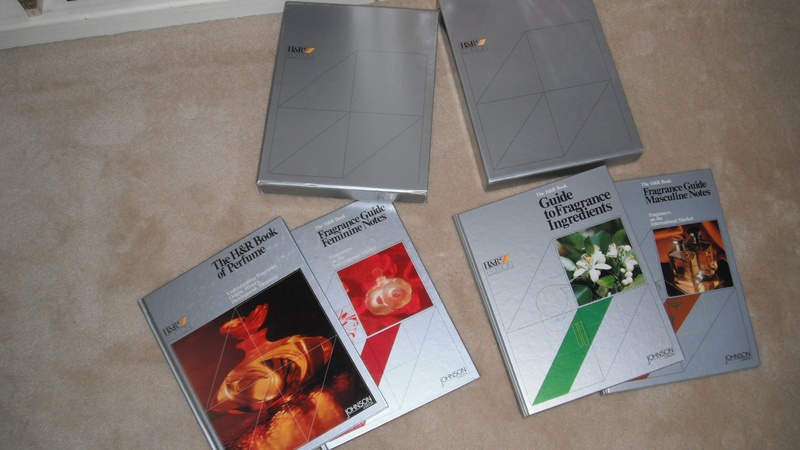 I have the original 4-volume set (in slipcases). I bought it in London in 1985. 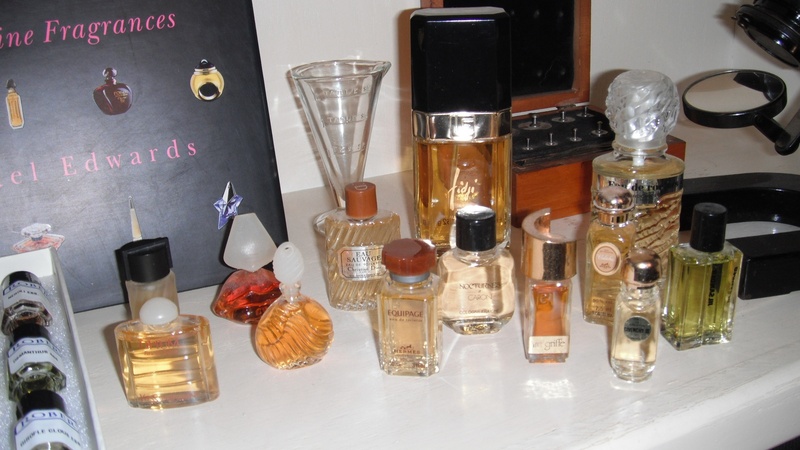 These were the first perfume books I ever purchased, and they are what turned me on to the world of perfumes. Before them, I was merely a casual sniffer. This is a beautifully illustrated guide to the great French classics. Unfortunately, it has become very expensive. The dark bottles on the left contain samples of the Oil of Anointment (from Exodus) and its various ingredients as described on page 62 in Chapter 8 of Aphrodesia. 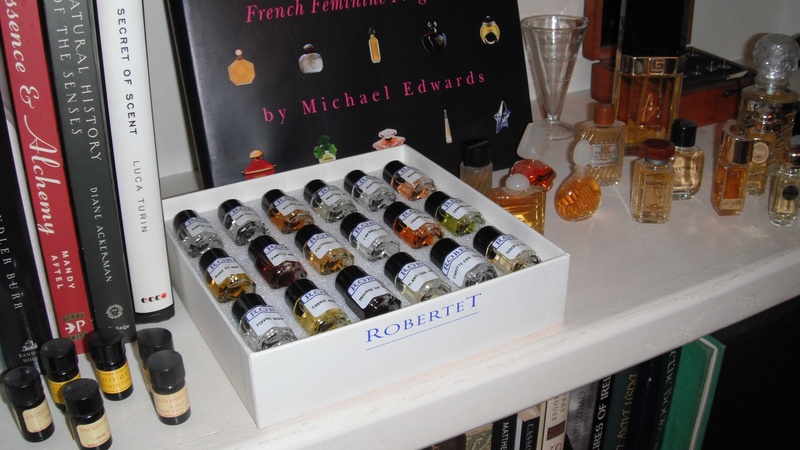 The white box contains a collection of essences John bought at ISIPCA. This book was, I believe, commissioned by the Osmothèque. I bought the English language version at ISIPCA, and Jean Kerléo signed it for me. It describes twelve perfumes, with each description accompanied by a smell pad. As such, it is a truly fragrant book. I have not seen it available online, but you can read Cheryl’s review at Now Smell This. I loved the photos of his library! I also appreciated the names of books that he thinks are significant or of value. 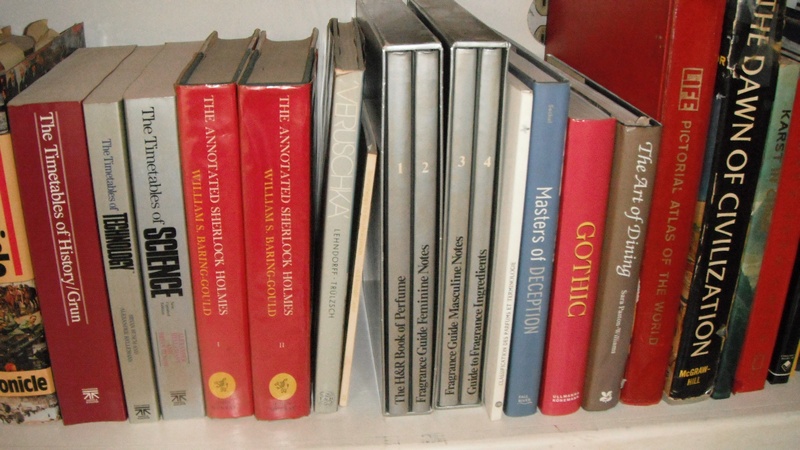 I was amused to peer at a few of his library books and see that we have some of the same books. For example, Daniel Silva’s espionage thriller, the annotated Sherlock Holmes, and “The Dawn of Civilization.” And I have a similar book to his “Karst in China.” LOL. Love to see a photo Kafka. Are they inbuilt? A home library of that magnitude is a luxury. I have seen a lot of karst on the Andaman Sea but there is nothing like Halong Bay – like drifting through a painting. We seem to have reached our limit below with the nestled comments so I’ll reply to you here. Kafka, I’m intrigued that you would have the Annotated Sherlock Holmes (I used to be a member of the Baker Street Irregulars), the Dawn of Civilization (which is ancient but still wonderful), and Karst in China (which I received as a gift during one of my business trips to China). That amount of overlap in comparatively obscure books suggests we probably share a lot of interests. Like you, I do not own a Kindle. I prefer physical books and have at least a thousand. If you feel like reading Aphrodesia, it’s available as a paperback from Amazon worldwide and can be ordered through almost any bookstore. BTW, I also don’t have a cellphone. My wife (who works at NASA and believes analogue is dead) says I’m a dinosaur. As for The Dawn of Civilization, history is my first love. I had wanted to get my PhD in the subject, eons ago, but ended up becoming a lawyer instead. But I once spent a lot of time studying everything from the classics to Mesopotamia, Ghenghis Khan, China and Japan. My main focus, though, was modern, interwar European history. I have to admit, I was more amused by the inclusion of Daniel Silva than anything else. And in an otherwise so impressively serious collection. 🙂 I have a few of his — Mark of the Assassin — next to some Joseph Finder and Vince Flynn. 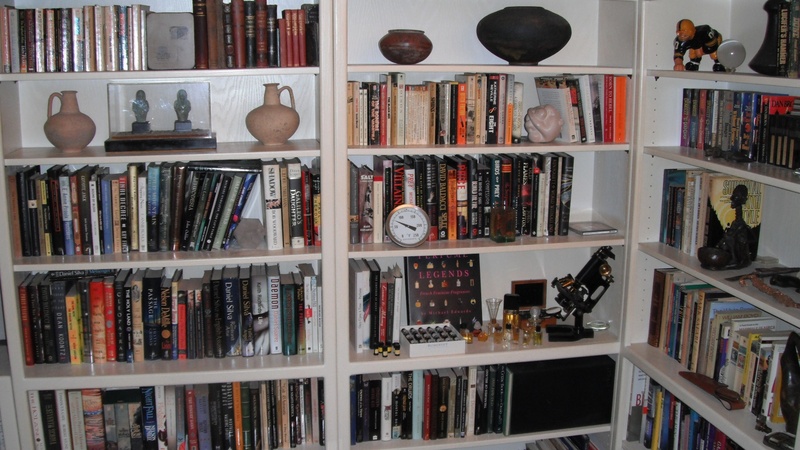 For some odd reasons, they’re in the same overall bookshelf with books on the CIA, NSA, Frida Kahlo and Hirohito. But that’s the joy of books, isn’t it? I definitely plan on getting your book in concrete paper form! Jordan’s description of it a little while ago piqued my interest, so I promise you, it’s been on my list of things to order for a while. As for your wife working at NASA, would it be the Houston Johnson division? If so, we may be neighbors of some sort. All the very best and thank you for taking the time to respond. I just wish I had more photos of your books. I love nosing around someone’s collection. LOL. Kafka, I write thrillers so I read thrillers. I like most of Silva’s books and admire his skill as an author. Ditto Michael Crichton, before he got political and the earlier works of Nelson DeMille, Tom Clancy, Dean Koontz, Wilbur Smith, Ken Follett… Follett’s The pillars of the Earth (not a thriller) is one of my all-time favorites. In terms of history, medieval Europe interests me most, after ancient Egyptian. My next book, Papyrus, centers on the late 18th Dynasty (the time of Tutankhamun). I also read books on the history of foods and dining, religion, architecture, magic, language, and a variety of other subjects. My own PhD is in geology (as is my wife’s). We spent most of our working lives in international exploration for Conoco. We’ve lived in a variety of places around the world and have worked in dozens of countries. I draw on those experiences in my writing. Yes, my wife now works at the Johnson Space Center. She’s also a member of the science team that operates and analyzes data from the Curiosity rover on Mars. In fact, she spent three months at the Jet Propulsion Lab in California immediately after Curiosity landed. We live on the west side of Houston. There’s also a contact link there if you want to keep in touch. It’s always a treat to find someone with similar interests. Wilbur Smith? WILBUR bloody Smith??!?! Excuse me now while I go write to you immediately! You may be the one person that I’ve met in over 2 decades who has mentioned the name of one of my favorite modern novelists! I loved both his Courtney series and his other one (whose name eludes me right now). I too love Nelson deMille’s earlier works and Ken Follett. In fact, as a teenager, I used to be able to quote parts of the Eye of the Needle. LOL. Other favorites: William Diehl, David Morrell, Jeffrey Archer, Thomas Gifford, old Greg Iles, and perhaps my all-time favorite, Frederick Forsythe. I think I saw some of your photos from China that Jordan posted but I will look for the one of your wife with the pandas. I quite envy her for the experience. I really will write to you. We are clearly kindred spirits. I have to say, I’m quite thrilled. Wilbur bloody Smith!!! I’m grinning like a loon! Wilbur’s Taita was the character I liked best in the Egyptian series. He has a property in New Zealand where he goes to write I think. Deep sea fishing off the NZ coast is one of his non- writing activities. Jordan, please pardon us for getting off the subject of fragrances, but I have to say I had a love-hate relationship with Wilbur Smith’s Egyptian series (River God, etc.). I loved the stories but hated the fact that there were many parallels between those stories and the version of Papyrus I was writing at that time. I’ve since made major changes to Papyrus (not because of Smith, but because Papyrus was way too long, and I changed the protagonist from the guy to the girl). P.S. there’s no longer any hate, just admiration for what a fine writer he is. I was unaware that he had a property in NZ and was a deep sea fisherman. Last I heard, he lived near Cape Town, on the Kogelberg Peninsula, and spent eleven months a year writing and the twelfth month blue-water sailing around the southern African coast. Kafka, it does indeed appear that we share MANY interests. But I hate to clog up Jordan’s website with our pursuit of them. I’ll write to you via regular email and give other perfumistas some space here for their thoughts. Jordan, if you’d like to stay involved in future “conversations” between Kafka and myself, I’m happy to include you in our emails. Kafka, is that all right with you? Like Kafka I do not own a kindle…between myself and three children we have well over 500 books! i just love the scent/feel of a real book in my hands! Right now I am working my way through the 44 Scotland Series by Alexander McCall Smith…but with all the wonderful authors you have introduced me to I will be seeking out their books at some future date! 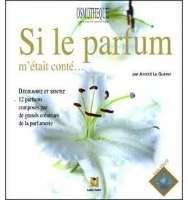 Yes well I started reading via Kindle on my phone because I coudn’t wait for the hard copy of The Perfume Lover by Denyse Beaulieu to arrive on my shores. 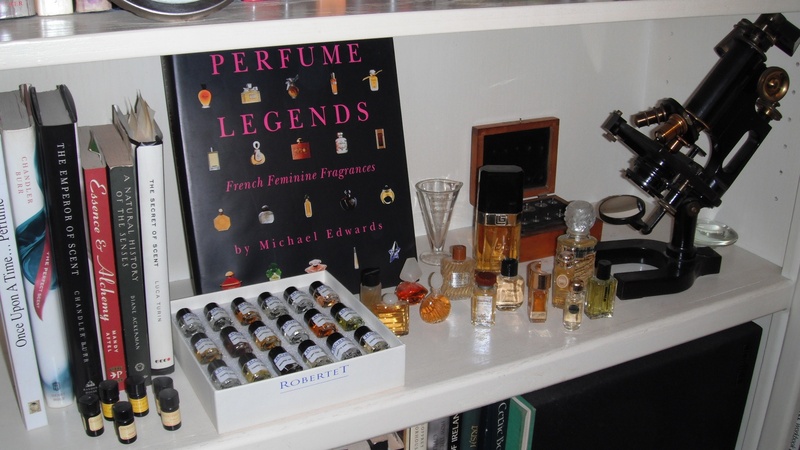 54 books later I am currently reading one of your favourites by the same perfumer who made a fragrance for Leonard Cohen. Kafka and John – no worries from me on the comments. It was all on topic – John’s reading list. A segue is fine too. Great to connect some kindred spririts – we all met in cyberspace. I have also emailed you both should you wish to go into further detail. And may I add my “two scents”? I LOVED this dialogue between Kafka and John! Nowadays we are so disconnected from each other in so many ways it is lovely to see two kindred spirits find each other….and nonetheless living so close by! Indeed, Jordan is a magical man 🙂 !!! And I love all that he is doing! I second Kafka’s thanks to Jordan.